I’m almost done with Anita’s chikan embroidery class! What a dramatic design! All that’s left is a little embroidery inside the paisley, under the heart. I’m still debating what color to use. What do you think? It’s also time to start thinking about what to do with the finished piece! I think I will need to use some kind of fray preventative on the edges of the fabric and hem it before I do anything else. It might be neat to frame it so that both sides can be seen. Or I could sew the entire thing onto the back of a jacket or something. Ideas? 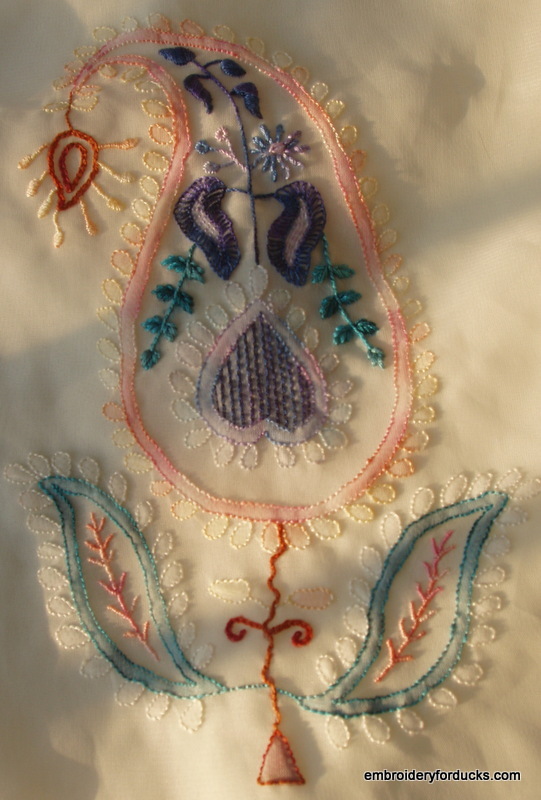 This entry was posted in Indian embroidery, My work and tagged Chikan (embroidery), chikankari, embroidery. Bookmark the permalink. Maybe mount it as part of a gauze curtain? that is an idea! Hmmmm. I stitched it on an extra large piece of fabric, since I wasn’t sure what I would want to do with it. On my next project maybe I will stitch a scarf, or hair ribbons.